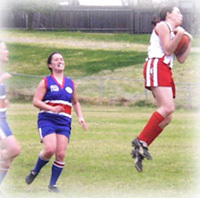 If you catch the ball on the full after it has been kicked by a team member or an opponent, it is known as ‘taking a mark’. The ball has to travel a distance of at least 10 meters and not have been touched by anyone else. The opposition can not tackle you immediately on taking the mark, unless you decide to play-on by moving forward / sideways off the spot you marked the ball. In most instances (and probably more so, while learning the rules), players will walk back a little, to take a run up to kick the ball. The opposition, at this point will be standing on the spot that you marked the ball to try to smother your kick or at least to distract you. There are 2 main types of marks – the chest mark (as shown above) and the overhead mark which is taken above the head. 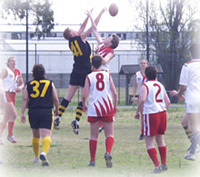 If an umpire deems that the ball was actually touched by another player or the ground before being marked, they will signal this by saying "touched – play on". Make sure you dispose of the ball quickly, as you may be tackled. 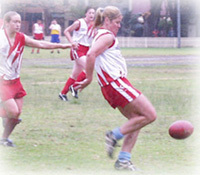 After kicking, handballing is the technique most used to move the ball around, and to maintain possession. You can’t throw the ball like in league, netball etc, but you can bat the ball in front of you, or tap the ball away from your opponent. To handball, position the ball on one of your outstretched palms, clench your fist with the other hand and punch the ball off your palm using a short swinging action with a neat follow through. When forming the fist, focus on using the triangular shape formed by your index finger to help guide the ball. If you are punching with your right hand, step forward at the same time with your left foot for control of balance. Its definitely easier to do, then how it sounds. Shepherding is one of the best offensive tactics. The idea is to prevent the opposition from tackling or getting close to the player in your team who has the ball. This can be done by positioning yourself between your team mate with the ball and any oncoming opposition. Arms are usually outstretched to minimise access by the opposition (see left), but you can also use the body or arm to push, bump or block. When the ball is unable to be played, the umpire will call for a ball up. It is not necessary for the same people to go up, but is usually someone with height. Only one person from each team can go up for the ball. You can only run 15 metres while holding the ball before you have to release it. You can continue to keep possession by bouncing the ball or touching the ground with the ball, providing you do it before the 15 metre limit. This is often done if you have no-one to pass to and you have clear space in front of yourself. Also, it is sometimes done to hold up the game, to give your players time to setup in their attacking positions if you are not in jeopardy of being tackled. Be careful not to get carried away with this one – as you should always look for your passing options first and may be caught holding the ball.